Usually, I am not a shopper. I would like to maintain this stand while Ankur may insist otherwise. The debate continues. However, there are a few things that I want in our house when we retire – paintings from Egypt, carpet from Morocco, lamps from Turkey…the list goes on…and the effort to knock each item off the list is also on. On the list, also appears lacquerware from Bagan. And now that I was in Bagan, it was time to make space in suitcase for some lacquer. 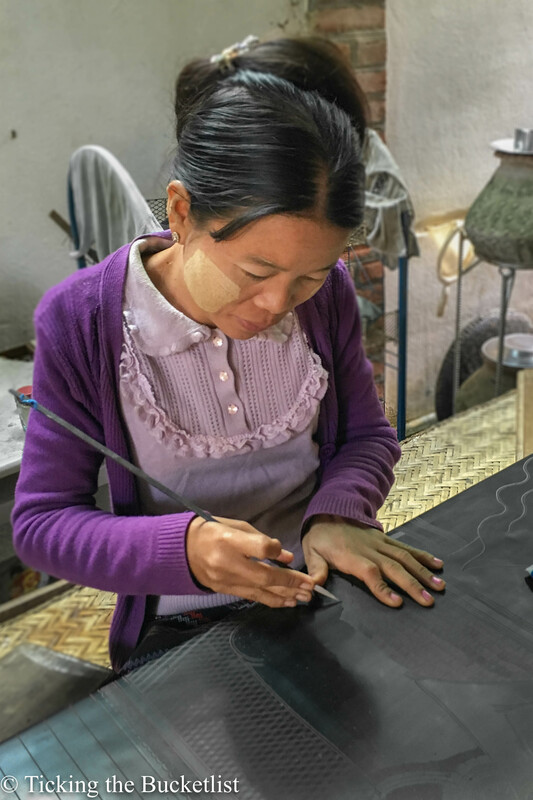 What makes lacquerware from Bagan so special? Lacquer is a naturally produced resin, obtained from the Melanhorrea Usitata tree. 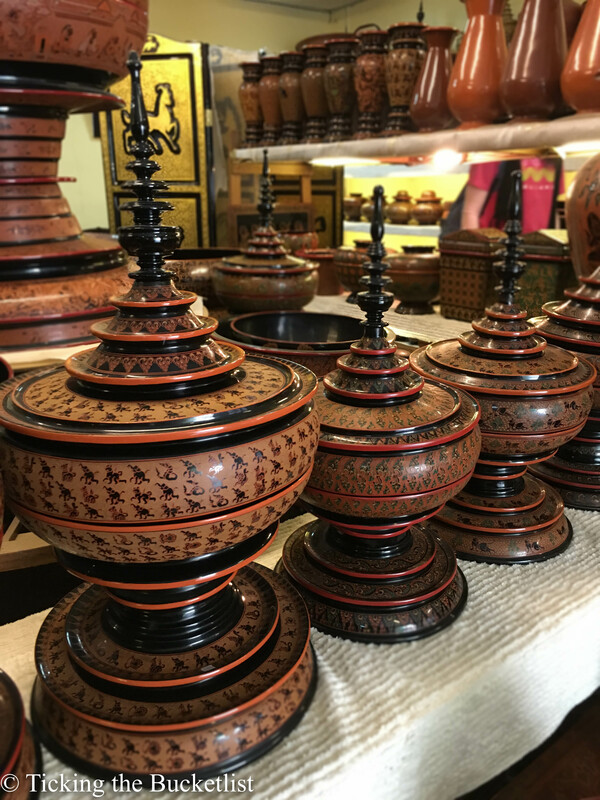 Lacquerware in Bagan is made by coating 7 – 16 layers of lacquer over a frame made using bamboo strips, wood or horse hair. 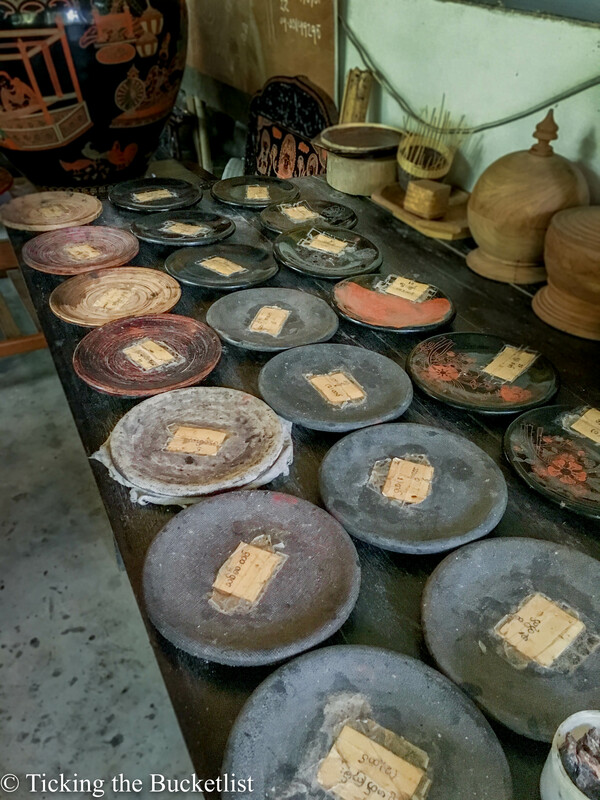 The first layer applied to the ware is usually that of pure lacquer resin, followed by next 3 – 4 layers of a mixture of bone ash and resin to provide rigidity and strength to the wares. Once the object is strong and sturdy, the next 7 – 14 layers applied are that of pure lacquer resin, which result in a shiny black surface. Between two successive coats, the wares need to be dried for 7 – 10 days in shade. Every layer requires smoothening, polishing and washing which takes considerable time and effort. Intricate designs are etched after the desired number of coats have been applied. The objects with the designs etched are coated with the first colour (usually red), dried, cleaned using water and rice husk and then coated with acacia gum to bind the colour. The red and black objects are further etched in the areas that require a different colour and the process is repeated with each colour. The final work of art in polished using petrified wood and is then ready to be placed on the shelf for sale. It can take 3 – 6 months to produce a good quality lacquer piece. It is a lot of handiwork and requires considerable skill and detailing! 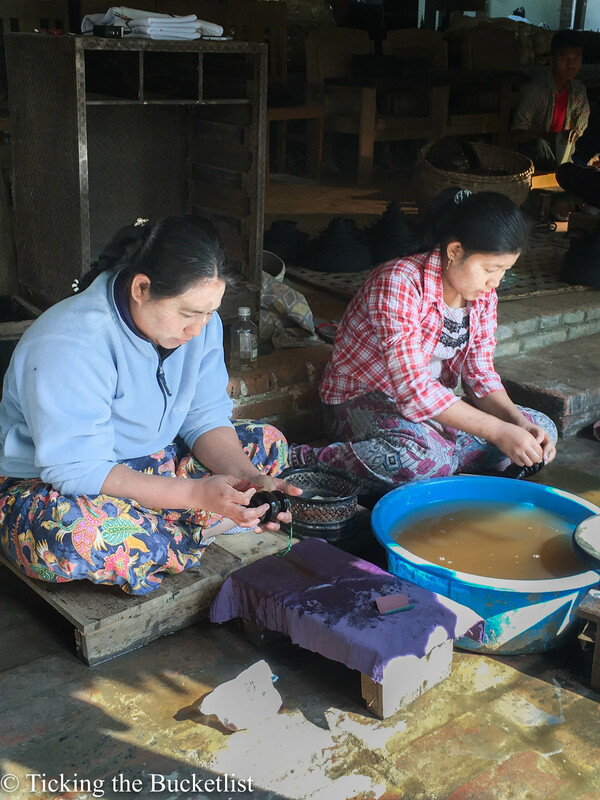 Making lacquerware is a profession that has been practised by families in Bagan for generations. 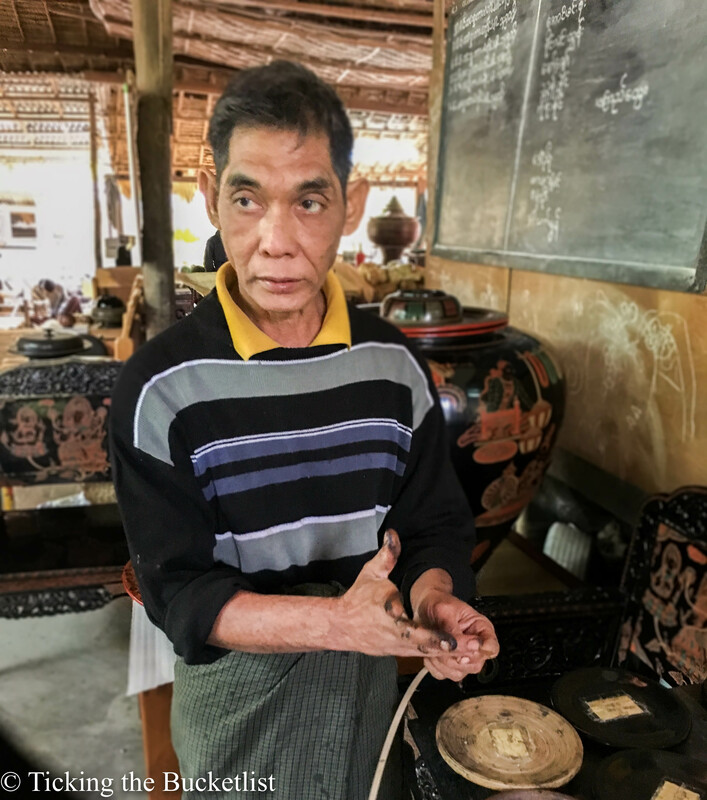 Most of the workshops are run by the locals who are happy to take you through the entire process. I visited a couple of workshops and was never pressured into buying anything. 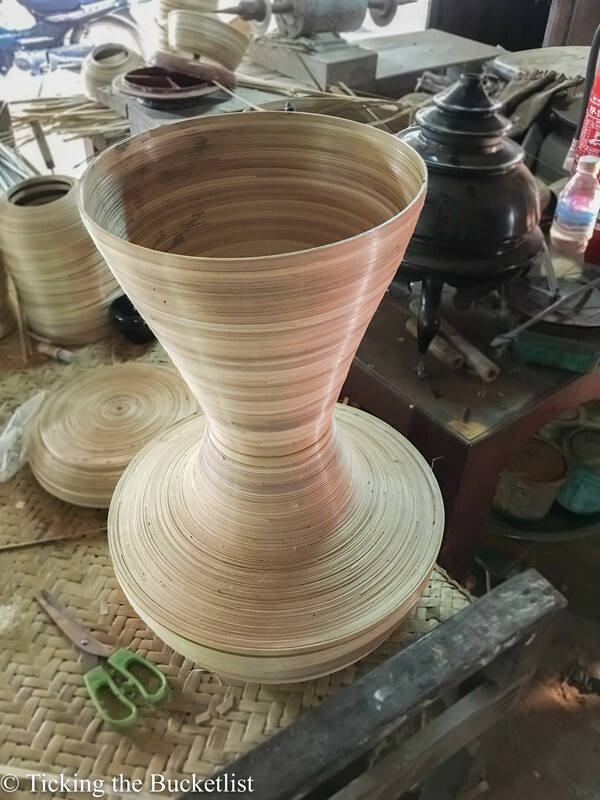 The first place I visited was the Lotus Collection in New Bagan who took me through the entire process… creating the frame using bamboo, coating lacquer, drying the wares, washing and scrubbing, etching the designs and the final steps of colouring and polishing. The process will make you appreciate the wares more and you will understand why they cost the amount that they do! While the shops are open till about 8 pm, most workshops are open to visitors from 11 am to – 5 pm… so time your visit well. The above mentioned Lotus Collection shop at New Bagan has high quality lacquerware. Their finesse was evident in the finished products. Also, they had everyday use stuff like tissue boxes that I could not find anywhere else. That being said, the place was more expensive than workshops in the Myinkaba village. The best place to buy lacquerware was the Myinkaba village. 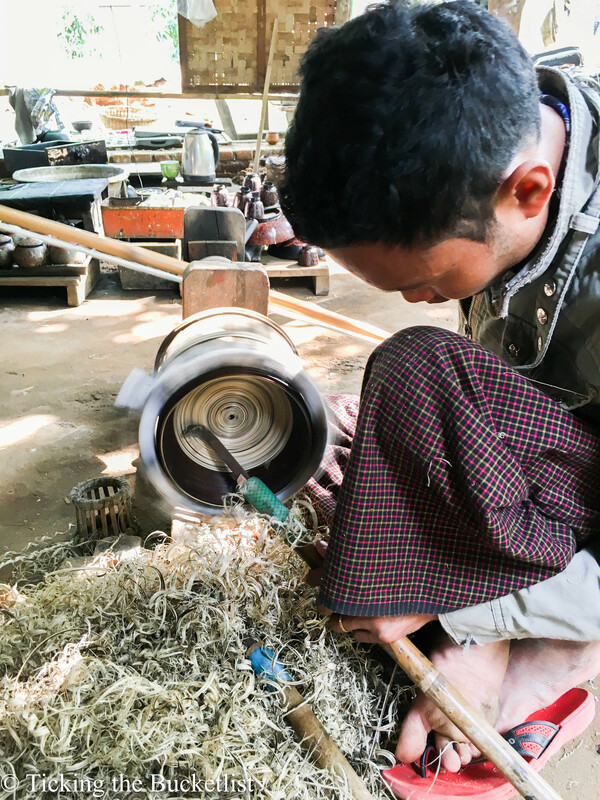 There are many workshops and shops in the village…on the main road just before entering Old Bagan… and inside the little lanes of the village. I explored three shops. The quality and price of the lacquerware was different in all three. 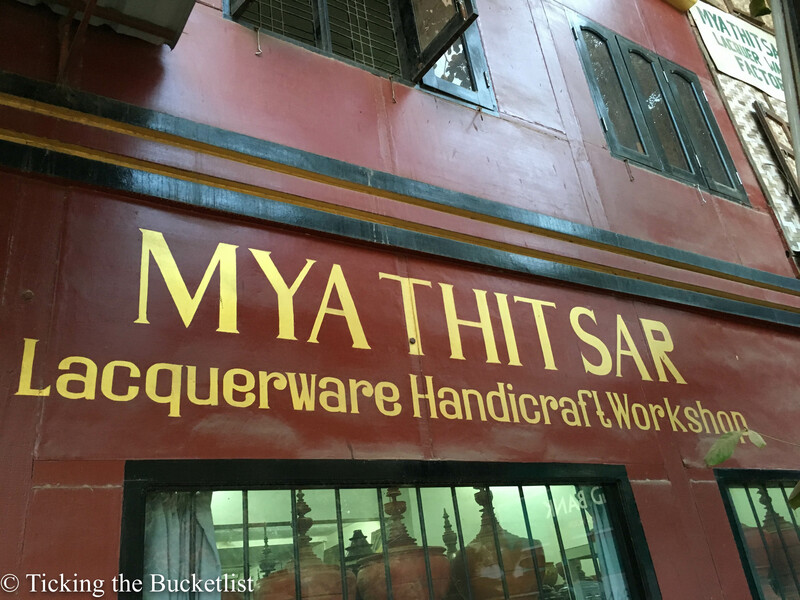 I finally ended up buying all that I wanted from Mya Thit Sar, a workshop on the main road itself as I was happy with the quality and the price. The base lacquer used to coat the bamboo objects is black in colour. The designs are etched on the finally layer and then, layers of colour are added. 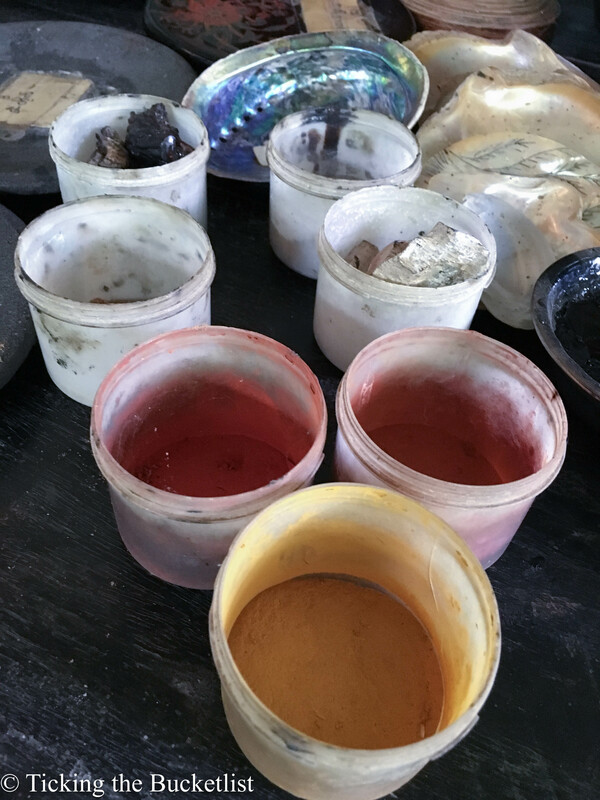 Traditionally, ochre, yellow and green are used and are made using minerals and naturally occurring dyes. If the wares shown to you have blue and purple, question the salesperson and ask him to show you one of these being produced. Such colours may look very appealing… but you might just be buying cheap imitation or even wares tactfully made using plastic for a handsome price! Addition of layers of lacquer results in the wares being shinier, resistant to the humidity and heat and obviously, stronger. However, each layer adds at least one additional week to the making time of the final product. Needless to say, the higher the number of layer, higher is the price. I would recommend that you buy wares with at least 7 layers… The ones with 14 layers, while stunning, were not in my budget. Then there are the really cheap ones with just 3 layers, which look dull and tacky when compared to the 7 layered wares. Low quality lacquerware is not good for ‘wet’ or hot/cold food and are good to serve peanuts only. It is best to ask the salesperson whether you use the ware for hot soup or cold salads. Most of the locals give you an honest answer and help you choose. I bought myself a set of coasters and two bowls that have been coated with seven layers of lacquer and are good for hot and cold food. I have been using them to serve hummus, cheese sauce and guacamole and they are holding fine! If quality is what you want and fine art work is what you are looking for… and nothing on the shelves appeals to you… say that aloud. A lot of shops have a little air conditioned room where the pricey and high quality stuff is kept. You can carry stuff from the shelf to compare quality and designs. Remember that stuff in this room will be at least 25% more expensive than that laid out on the shelves… but the quality and finesse truly call for it. Even if you don’t want to pick up something from this room, it is worth spending a few minutes to look at the high quality products. I wish I could carry all of these back home! The local shops give a 15-20% commission to the tourist guides/taxi drivers who lead you to the shop where you finally make your purchase. If you go without a middleman, the workshops are happy to offer the discount to you. If you pick up a considering amount of wares, you can get an additional 5% off. 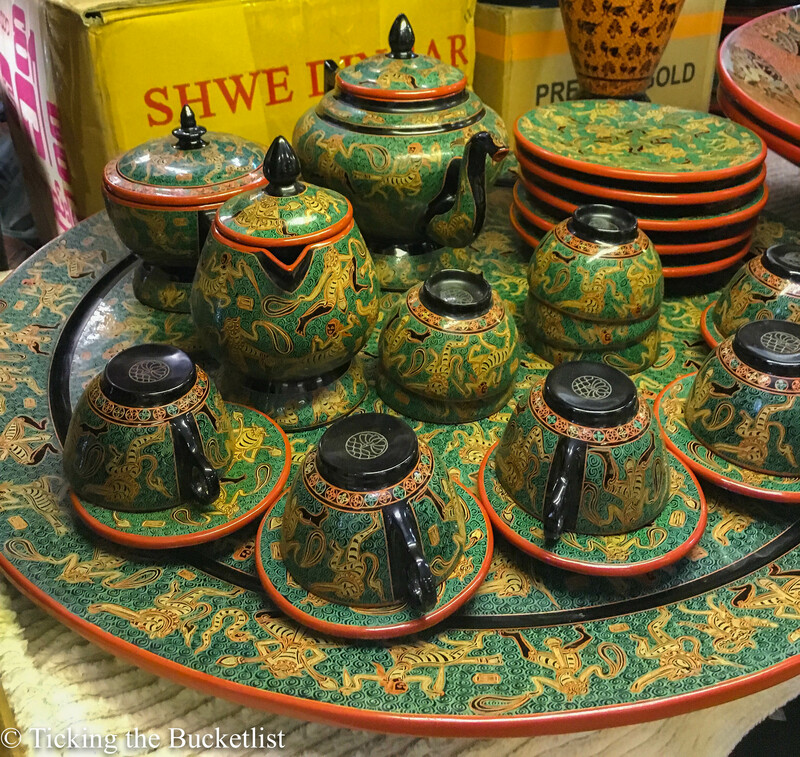 I picked up the bowls below (quoted at USD 18 each) and an ornate box with six coasters (quoted USD 50). I got a 25% discount on the overall purchase. 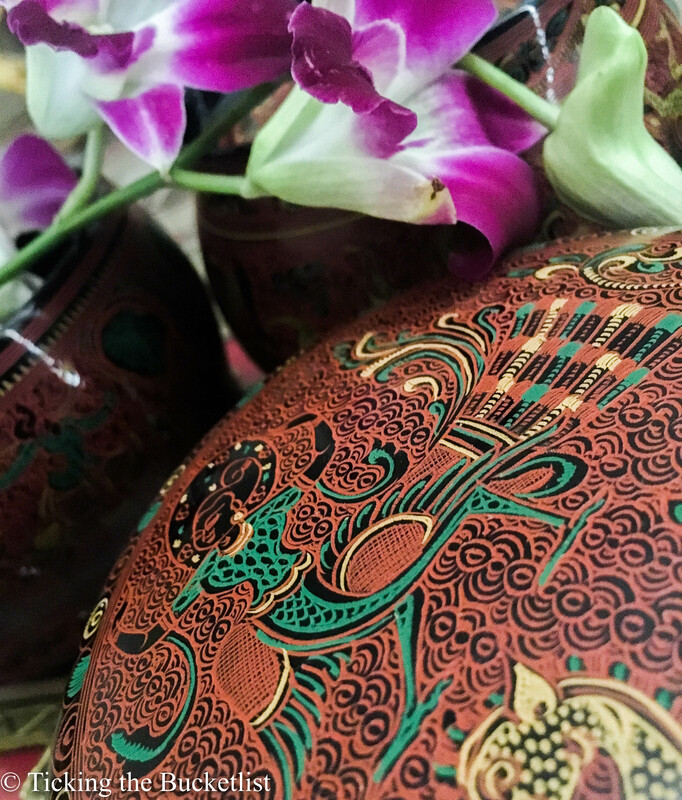 The lacquerware from Bagan sure is a souvenir worth having… go on… indulge… and shop to your heart’s content! Great post. 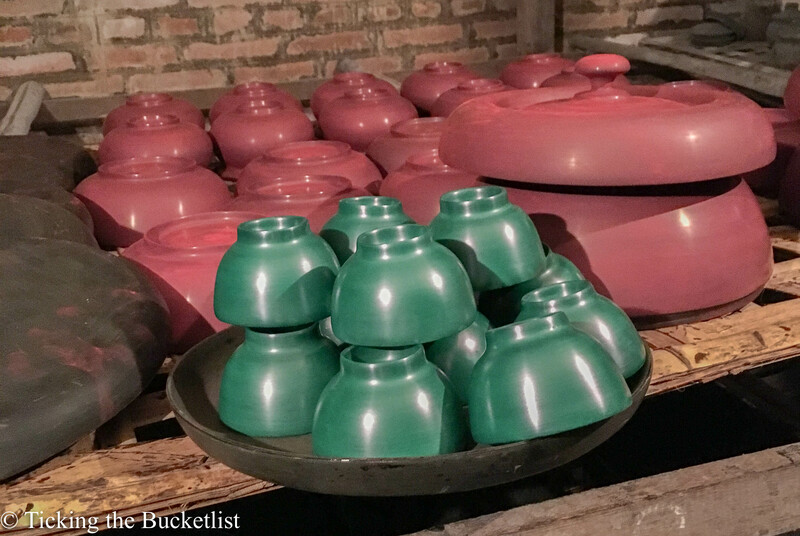 I traveled to Myanmar with my mom and we loved looking at all the lacquer. The umbrellas were beautiful too! Thanks Maya! I loved the lacquer shopping…its so unique and looks lovely on the table! We also bought from this store in August 2016 and managed a 5% discount from their list price. Seems there is not much in the way of negotiation on their prices. Our guide took us there so I hope he got his commission. We went there without a guide though. I saw lots of shops before I got to this one and quite liked the finesse of his work. Though I must say, Lotus possibly had the best quality! I am also an artist and love to see these kind of cultural stuff. Lacquer i know by name only but from your blog i can understand the process better. So this is a small cottage industry where you have got all infor? And if we want to go there can we or we have to take some special permission? There are various shops and each is a different set up doing the same thing. You can visit any shop and they will show the process … no permission except the shop owner’s permission is needed! When we were in Myanmar we skipped shopping, bought literally nothing back! It’s interesting to read and know why the Lacquerware from there is special and unique. Great for showing us how it is made at their workshop!